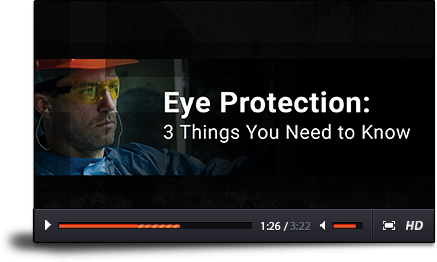 Why do 90% of eye injuries happen to workers who wear eye protection? Email addresses are never spammed or sold. Opt out with one click. Why are there are so many work related eye-injuries? OSHA estimates that thousands of people are blinded every year from work-related eye injuries at an estimated annual cost of $300 million in medical expenses, lost production and workers’compensation. Walk through most jobsites and you'll see plenty of workers wearing safety eyewear. The question is—are they wearing the right eye protection? Workers come in all shapes and sizes. Why should PPE be any different? You may think those injured workers must not have been wearing their safety glasses, right? WRONG. 90% of those injuries happened when an object or chemical went around or under the protective glasses. 90%! Thats a tough stat to swallow when you're paying for protective gear that isn't doing it's job. One-size-fits-all shouldn’t be your safety motto. Differences in aperson’s gender, weight, age, ethnicity, and more can impact the size and shape of their face. If safety equipment doesn’t fit, it won’t protect or workers simply won't wear it. Period. One-size-fits-all should never apply to eye protection. Learn why all eye protection is not created equal. There could be overlooked hazard factors in your safety routine. Make sure your workers are protected with these helpful tips! Understanding one of the most under-rated aspects of eye protection. We've done the research for you. Get instant access to information that will do more than just save you time, it can also save a worker's eyesight!